Packing: Delicate Ring Box + FREE Jewelry Polishing Cloth, READY to be a gift. This series of personalized rings can be engraved with Names, Dates, Initials, or other short msgs meningful for you. - If you need to review the item before shipment, just tell us in your email. ·Are you looking for the best anniversary gift for your beloved? ·Are you tired of cheaply made ring that would break after a while? ·Do you need the most thoughtful & meaningful piece of jewelry to match your outfits? ·This custom women ring must be your good choice. ☺☺☺ 100% Satisfaction, it's just that simple. or leave your question into "Customer Questions & Answers" . ★ Customized Steps: 1 - Choose style. 2 - Click on "Customize Now". 3- Type in Names in the Box. ★ DIY Options - You can DIY this spiral ring with any texts special for you or your beloved ones. 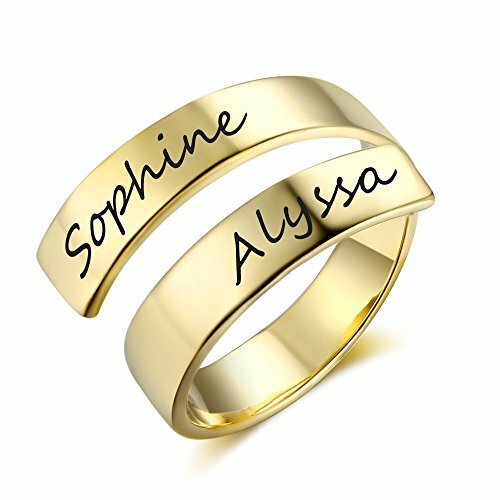 ★ Perfect Gift - With heartful design, this twist ring with engraved names was born as a perfect gift for yourself and your dear family. Want a unique women promise ring with names? Looking for an amazing memorial gift? It must be your best choice. ★ Occasions - Lovers Gifts, Promise Ring, BFF Gifts, Birthday Gifts, Anniversary Ring, Mother-Daughter Ring, Sister rings. ★ 30-Day Money Back & Defective Exchange Guarantee, no-worry purchase! If you have any questions about this product by Love Jewelry, contact us by completing and submitting the form below. If you are looking for a specif part number, please include it with your message.